The CESRA workshop in 2007, titled Solar Radio Physics and the Flare-CME Relationship, was held at the University of Ioannina in Greece. Some 70+ participants attended the meeting, which consisted of invited and contributed talks in the mornings and working group discussions and presentations in the afternoons. The topics for the four working groups were 1) pre-flare and pre-CME phase, 2) flare and CME energetics, 3) particle acceleration related to flares and CMEs, and 4) multi-frequency observations related to flare/CME shocks. The local organizers, A. Nindos (chair), A. Fotiadi, P. Preka-Papadema, and V. Tsikoudi made sure that everything run smoothly, and by the end of the week we were all impressed by the Greek hospitality. A composite image showing an X-ray plasmoid and simultaneously observed drifting pulsating structures at decimeter waves in the radio dynamic spectrum (adopted from Ohyama and Shibata, 1998, and Kliem et al., 2000, and combined by Barta et al.). Plasmoid dynamics similar to this event are studied by Barta et al. in the newly released Solar Radio Physics Topical Issue. The 2007 workshop addressed the role of radio diagnostics in the physics of flares and coronal mass ejections (CMEs), to reveal the relationships between these two phenomena. Radio astronomy is a tool to study both impulsive and long-duration energy release and particle acceleration. Gyrosynchrotron radiation and coherent radiation processes are sensitive to non-thermal electron populations, and they are well-observed in radio. With gyrosynchrotron emission we can trace the high energy electrons, since the higher the energy, the higher the emitted frequency. Extending the observations to ever higher frequencies will therefore allow us to probe the high energy limit of particle acceleration at the Sun. Radio measurements are a fundamental remote sensing tool to study coronal and interplanetary shock waves. While CMEs are plausible shock drivers — and are indeed identified as such in the interplanetary space — the question whether there are other sources, and what characterizes the coronal shocks, is still open to a large extent. Radio emission from unstable electron populations is a tracer of basic processes of energy release that we hope to map with new facilities. Instruments like the Frequency Agile Solar Radio Telescope (FASR) and the Chinese Radioheliograph will provide the first imaging observations of solar flares over an extended spectral range. The new wavelength range to be imaged includes decimeter waves, where spectrographs show that key processes of energy release and electron acceleration occur during flares. Finally, radio emission is also a probe of the propagation of energetic electrons through the corona and interplanetary space, because the radiating electrons have small gyroradii and are confined to follow the magnetic field. The related radio emissions are therefore a tool to investigate energetic particle propagation to and in the Heliosphere. Many of the papers included in this newly released Topical Issue were presented and discussed in the CESRA 2007 workshop, but the issue was also made open for general submission on the core topics. The issue is divided into sections that discuss certain topics, after the first introductory review Radio Emission of Flares and Coronal Mass Ejections by A. Nindos, H. Aurass, K.-L. Klein, and G. Trottet. The first section deals with microwave flare morphologies and spectral characteristics (papers by Melnikov et al. and Tzatzakis et al.). The next section describes spectral fine structures in solar radio emission (papers by Jiricka & Karlicky, Kuznetsov, Tan, Wang et al., and Huang et al.). 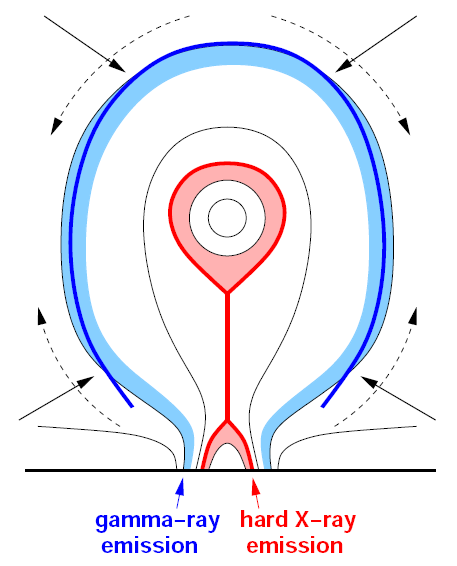 The third section consists of papers on the theory and modeling of plasma physics in the solar corona (papers by Tsap et al., Barta et al., Ledenev, and Anastasiadis et al.). The fourth section starts with an invited review Origin of Coronal Shock Waves by Vrsnak & Cliver, and continues with both theoretical and observational studies on CMEs and shocks (papers by Zic et al., Pomoell et al., Grechnev et al., Pohjolainen et al., and Magdalenic et al.). The last section of this issue is on instrumentation (paper by Ramesh et al.). The Solar Physics Topical Issue Radio Physics and the Flare-CME Relationship (Volume 253, Numbers 1-2 / December 2008) can be found online at the journal website. Radio dynamic spectrum (AIP, Tremsdorf Observatory) shows two type II bursts, with low and high frequency components of the band-split. 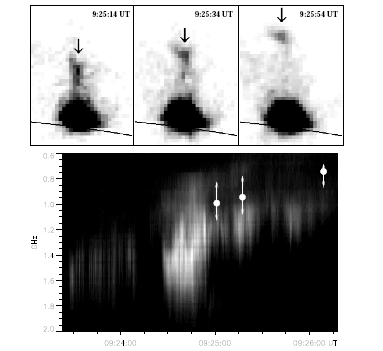 Radio imaging from the Nancay Radioheliograph (NRH) shows the first type II burst at 13:10:07 UT (contours), and the dashed curve and cross show the corrected burst position at the time when the SOHO EIT image was taken (more details and analysis in Magdalenic et al.). 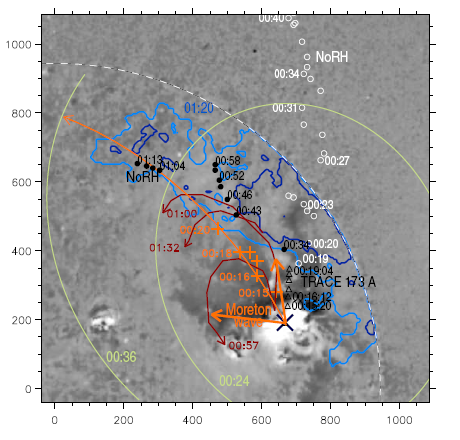 A multiwavelength study of a complex flare-CME event is presented by Grechnev et al., and it includes radio imaging at 17 GHz from the Nobeyama Radioheliograph (NoRH). A blast wave shock is also observed, together with dimmings and absorption phenomena. A schematic model of favorable sites for particle acceleration; the shock wave has in this case quasi-perpendicular regions at the nose and the flanks of the erupting flux rope (MHD simulations and model by Pomoell et al. ).